Embedded receivers with hinged lids: Hinged lids double as protective covers and lockable fasteners. Lids close flush to prevent obstruction and swing open to house bollards. Padlock bollards to prevent tampering and theft. Embedded receivers with chains: Use chains to fasten bollards securely within embedded receivers. When bollards are removed, chains can be stored inside receivers and concealed with a protective cover to prevent tripping. Galvanized and stainless steel: Removable mountings are available in galvanized and stainless steel. Galvanized steel features a protective, anti-corrosion coating. Stainless steel, due to its natural corrosion-resistant properties, is more suitable for corrosive environments (e.g. with regular exposure to salt water and de-icing salts). Powder coated steel: Powder coatings create thick and durable finishes that resist abrasion and won't crack, chip or peel. Electrostatically charged powders create even surfaces that won't run or sag—ensuring uniform coatings across all horizontal and vertical surfaces. The hard, protective layer covers all exterior metal surfaces to prevent surface damage and corrosion. Stainless steel: Stainless steel is naturally resistant to corrosion and wear. Reliance Foundry uses high-quality 316 grade stainless steel for the highest resistance to corrosion—even in high-saline environments. Stainless steel offers a bright, reflective surface, ideal for contemporary designs. For additional convenience and usability, bike-locking arms can be installed as handles to aid installation and removal. Removable bollards are ideal for mixed-use spaces, where needs often change. Use removable bollards in public squares and plazas, where activities and vehicle access vary with day-to-day events and festivities. 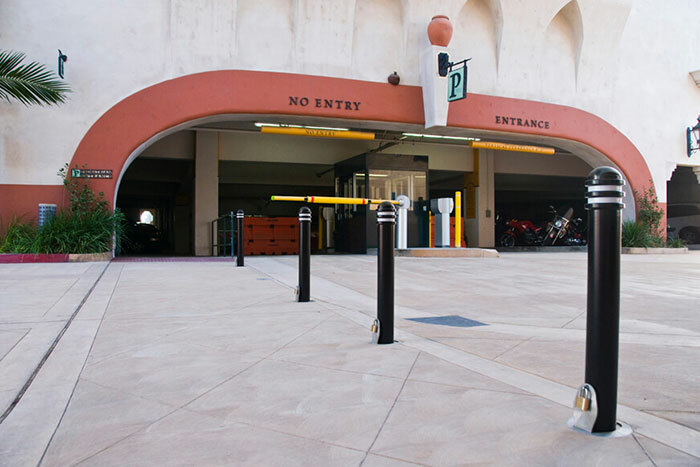 Removable bollards offer seasonal opportunities to optimize parking and other services. Open parking spaces may be more valuable in winter months, while a sectioned-off perimeter can allow for an outdoor patio in the summer. Bike-locking arms allow vehicle parking spaces to be converted to bike parking during warmer months.